On June 1944, Freda Wineman and her family arrived at Auschwitz-Birkenau, the infamous Nazi concentration and death camp. After a cursory look from an SS doctor, Freda's life was spared and her mother was sent to the gas chambers. Freda only survived because the Allies won the war - the Nazis ultimately wanted every Jew to die. Her mother was one of millions who lost their lives because of a racist regime that believed that some human beings simply did not deserve to live - not because of what they had done, but because of who they were. Laurence Rees has spent 25 years meeting the survivors and perpetrators of the Third Reich and the Holocaust. In this sweeping history, he combines this testimony with the latest academic research to investigate how history's greatest crime was possible. Rees argues that while hatred of the Jews was at the epicenter of Nazi thinking, we cannot fully understand the Holocaust without considering Nazi plans to kill millions of non-Jews as well. He also reveals that there was no single overarching blueprint for the Holocaust. Instead, a series of escalations compounded into the horror. Though Hitler was most responsible for what happened, the blame is widespread, Rees reminds us, and the effects are enduring. The Holocaust: A New History is an accessible yet authoritative account of this terrible crime. A chronological, intensely listenable narrative, this is a compelling exposition of humanity's darkest moment. Makes for grim but important listening. Rees traces the rise of Hitler and the progressive stages of the Holocaust with great clarity. There are several important points to take away. Hitler's views on the "final solution" evolved over time; he managed to convey his intentions to his subordinates without actually writing anything down; and one of his key maneuvers was to repeat The Lie again and again, in the absence of evidence and even after his claims had been positively refuted. Other points: the Allies had the full details on the death camps by 1944; they chose to do nothing for reasons that sound hollow; and the ordinary people who made it possible for Hitler to carry out his extermination were neither hypnotized nor, in many cases, especially conflicted about what they were doing. Another point, although it's one the author doesn't make explicitly (at least as far as I can remember): unless we are forever vigilant, it could happen again. Eric Vale is an energetic and expressive narrator. What did you love best about The Holocaust? The information is very detailed and thoroughly researched. It could not possibly be any better in that respect. What other book might you compare The Holocaust to and why? The performance was terrible. Mr. Vale was not the right person to narrate this book. He could not even pronounce names correctly, such as saying Joseph Goebbels name as GO-BELLS, instead of GUR-BELLS, and saying Hermann Göring name, as GORE-ING, instead of GAIR-ING, or even worse saying Lebensraum as LEEBEENSRAM, instead of LAY-BENS-RUM. This book needed a quality, thoughtful, strong voice, with excellent diction. Vale sounded like a substitute that was just hired at the last minute, and he narrated as if off of a script with too much emphasis on drama at all times, instead of pacing himself properly. This book is a 10 in research and in the depth of knowledge covered, but the audio version was just plain awful. A big 0. Just about the narrator. The book was amazing, a 10++, but the narrator almost made me want to turn it off, especially when he continued to botch the rightful names of key figures, and key names. He was awful in every respect, and I give him a 0. 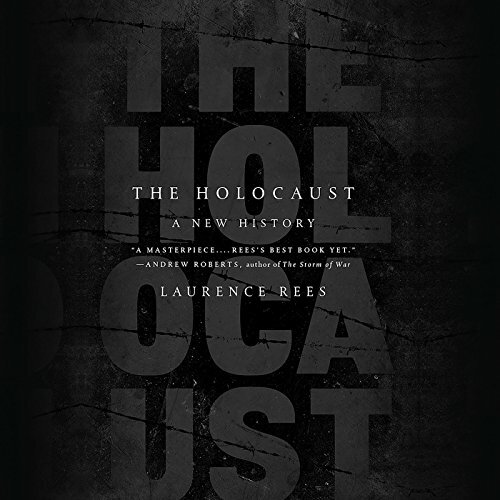 Filmmaker Laurence Rees is a well-known for his documentaries on the Holocaust. In this book he relates how the Holocaust came about. It wasn't one definitive moment that started the Holocaust nor was it necessarily a directive coming straight from Hitler. It's a complex history. If you've studied Hitler, then you know that he wasn't much of a leader. He purposely let his subordinates figure out how to carry out his philosophy and wishes. He enjoyed the squabbling that ensued among his subordinates. What I found annoying with the audiobook was the mispronunciation of names of people and places. The narrator got some right or he'd pronounce a name two or three different ways. For as much research that has been done on World War II, the narrator should have gotten the correct pronunciations of German, Polish, Yiddish, Russian and other names and place names. It was frustrating to hear him butcher names in such a long audiobook. The point I'd like to make is that the content of the book was excellent and thorough. a book well worth your time to listen to. very moving and fact based well worth the time spent listening to. It makes you remember to not forget history so it won't happen again. If yp u are interested in this, mankind's darkest time, you must read this. It brings new insight into the vast pieces and puzzles that made up this horror. This should be mandatory reading for every high school/college student the world over. Such accurately detailed eye witness accounts and research make for compelling, albeit horrific, listening. It is important to know the truth of how a dictator came to power and twisted minds while breaking hearts, bodies and spirits. I certainly take no pleasure in the suffering of others; after all, every one of my grandparents and grandparents-in-law were survivors, and had lost almost all, or indeed, all family members to the Holocaust extermination machine. But I was enthusiastic that there was someone who investigated and penned the complete, undeniable history. sad but nicely told. issues like this are quite troubling but true to human nature..
Great book and great narrating! Loved the narration of this book. It was alos extremely informative and helped me better understand the events that took place.